As the Department of Veterans Affairs embarks on its own electronic health record replacement, IHS puts out a request for information as it explores updating its RPMS system. The Indian Health Service posted a request for information as part of exploratory market research to assess innovations for modernizing its electronic health record system. Right now, IHS uses what it calls a self-developed, integrated "government-off-the-shelf health information system-of-systems" known as the Resource and Patient Management System, or RPMS. "IHS' objective is an effort to modernize, augment, or replace RPMS legacy health IT systems, including, but not limited to, its clinical, administrative, financial and HIT infrastructure," IHS explained in the RFI. Toward that end, IHS is using to better understand the available options related to a number of imperatives, including practice management, clinical decision support, quality measures, interoperability and HIE, population health management, privacy and security and more. 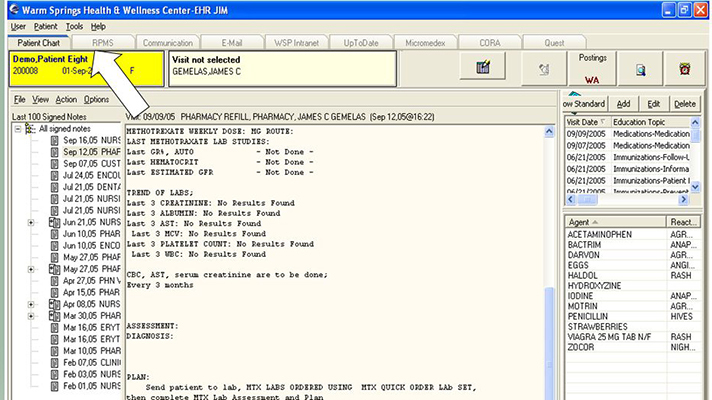 The agency’s current EHR is a "distant cousin," as IHS officials put it – derived from the same legacy system and using many of the same apps – to both the longtime VistA proprietary EHR used by the Department of Veterans Affairs and the Composite Health Care System used by the Defense Health Administration. Now would seem to be a logical time to consider alternatives to the RPMS – which is in operation at IHS Federal, Tribal and Urban hospitals and health centers across 36 states, where IHS delivers care for some 2.2 million American Indians and Alaska Natives – given that RPMS' cousins at VA and DoD are in the process of being replaced by Cerner technology. IHS says its "multiple legacy systems and disparate data stores, developed over four-plus decades, are in need of modernization to ensure and enable sustainability, flexibility, intra/interoperability, patient data federation, population health, and clinical quality measures, toward improved continuity of care." At the same time, given the many shapes and sizes of IHS facilities, with varying degrees of connectivity/bandwidth, officials said a one-size-fits-all commercial-off-the-shelf EHR approach is unlikely to work from the standpoints of both functionally and economic feasibility. So its request for information aims to learn more about "art-of-the-possible" practical COTS technologies that, alone or in combination, can help address IHS' 21st Century needs.